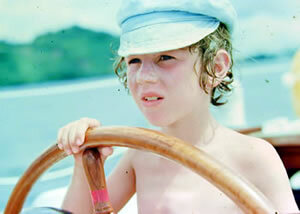 MATTHEW ASTON sailed off around the world at the age of nine. Now an old salt of 15, he reminisces about his encounters with the denizens of the world’s oceans. My Father had a dream of sailing around the world. If he had told me six years ago when I was nine just how far it was, I would have stayed at home. But in those days I was eager to set sail and leave my school friends at their desks, high and dry in the classroom. What I didn’t know was that on a yacht there are more jobs to do than you could ever imagine. Luckily though, I worked out that fishing was counted as a job and I was able to spend hours and hours at the stern, both at sea and at anchor. I got pretty good at fishing and although I don’t like eating fish, Mum and Dad and my brother David always had a good feed, thanks to me. When we anchored in a quiet bay somewhere, they would sit in the cockpit and look at the sunset while I spent hours with a handline or rowing up and down trying out a new lure I’d made. On our long passages my job was to check the trailing line or set out the rod, not just for a tasty meal but also for the excitement of the screaming reel, the rod bending and a leaping fish in our wake. When we talked to other yachties about the fish we’d caught, some would say, “There’s no fish out there” while others would catch enough to eat on every day of their trip. We trailed our lines around the world and I had to experiment with different lures and rigs all the time. In the mornings and evenings travelling at about six knots with fairly clear skies, I got the best results. The right lure must be shiny and active to attract the fish’s attention. My favorite line has a silver head and a sparkling eye. I set out about three times the boat length and let it run near the surface. Using the rod and my smallest lure, a 12kg line will catch a nice dolphin-fish, mackerel or even a tuna. The ratchet on the reel saved us losing many fish: we would jump into the ‘fighting’ position on the coach house when we heard it slow the yacht down and play the fish alongside for gaffing. With our 80kg ‘killer’ rig I was sometimes a bit late in checking the line and found only a fish head, the lure stripped, or the rig broken. On route from Tonga to Fiji I once pulled in a rare snake mackerel, very much damaged by the force of the water which was a pity. We always meant to fix a bell as an alarm. Nevertheless our trusty rig has more than paid for itself with many exciting catches. Pulling in a 10kg fish when we are under spinnaker and unable to slow down is like having a huge tiger shark on the line and for this I always wear gloves. Once, I’d pulled in a big one and was sorting out the tangle of line on the back deck when another one hit: I was nearly pulled over by loops of line around my arms and legs. For more hook-ups, when setting up a trailing line you should make sure the hook is right at the tail of the lure and use the strongest hooks available - preferable a two-ganged type. There a big fish out there and you need the strongest equipment you can possibly find. When crossing from Panama to Galapagos, El Nino had stopped the Humbolt current and the fish were pretty scarce. After a few days out the wind was very light and sailing at four to five knots we’d seen a beautiful pod of humpback whales, some seabirds, plenty of flying fish but nothing on the line, when suddenly a school of bluefin tuna arrived. They looked terrific, racing us a few meters from the boat and leaping out of the water to intercept the flying fish in mid-air. We watched them until dark, happier to just sit and enjoy their antics rather than try to catch them. In the morning they were there again, and the next morning: it was too much for me so I made up a lure of plastic tube, a bit like a tiny flying fish. With my light rod I made up a lure of plastic tube, a bit like a tiny flying fish. With my light rod, I lobbed it under the nose of one, jerking it out of the water like the real thing. Bang! I had a 5kg tuna on the line. It was too easy, but he looked so sad on the deck I threw him back only to catch his brother, then another and another until I must have caught the whole family and thrown them back. They stayed with us four or five days then they lost interest in the game as we approached Academy Bay, but I’d had a ball! Trolling in a quiet harbor can also be fun. Rowing quietly along a new shoreline a dusk with a variety of small lures is a sure way of meeting the local fish population. I try wobblers, spoons, feathers and plastic squid until I strike one that works. But I have also used other, less conventional methods. In a remote secluded bay in Indonesia I came across a school of redeye milling around by the shore. With a few frantic scoops I had 10 good size fish flapping about on the sand. That was certainly one of my favorite spots. So if you’re planning a cruise or just sailing for the weekend away from the crowd my advice is to always trail a line. You might even be lucky enough to pick up a beautiful mahi-mahi (dolphin fish) - they’re almost good enough to eat!